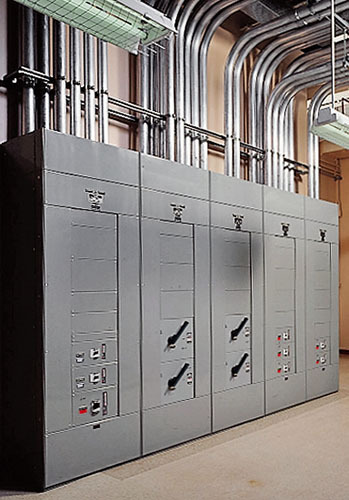 We manufacture a comprehensive line of low voltage power distribution switchboards featuring bolt-on circuit breakers, fusible switch units and motor controls. We use an enhanced distribution bussing system, originally designed in the 1950’s, which enables our configurations to accommodate any combination of branch circuit breakers, fusible switches and/or motor controls mounted in the same distribution switchboard section. Our bussing is completely drilled and tapped for future additions of branch devices. We stock an extensive inventory of circuit breakers and field installation hardware kits to support our customers’ needs for quick shipments. We typically have a larger inventory on the West Coast than anyone else in our industry – including our suppliers and the other major vendors. We do not adhere to Just-in-Time inventory practices so that we can better support our clients.